In the last months, Stellar Lumens [XLM] has been taking center stage almost in a daily basis with its initiatives becoming highlight of the market, to the extend where the firm and cryptocurrency they developed could take on and tackle down various competitors on its way to the top. The potential of that particular market-conclusion is very high for the most consolidated companies like Ripple or Ethereum, which are feeling the challenge put on by Stellar teaming up with IBM in its most recent development. A plan set in motion that could put its lumen technology on all central banks around the world. The partnership guarantees the use of Stellar to settle almost instant cross-border payments by digitally connecting fiat currencies on both ends of the transaction. Stellar now becomes a sort of bridge that was earlier occupied by Swift. With talks of several global Central banks considering issuing their own digital cryptocurrency and given that many of these banks use IBM products and services in their backend, it is only natural to assume that the new crypto by these Central banks will be on the Stellar blockchain. Still, it is early to determine if that would be the final result, but if so, not only would be a very serious competitive ambush for companies like Ripple, it would also make the price of Stellar grow significantly. Furthermore, if we rewind a little bit the time we can see the event that set a milestone back in January when the $39 million ICO, Mobius, chose the Stellar network over the one of Ethereum. At the moment the decision responded to the Ethereum security and scalability problems, a great risk that, of course, the Mobius project couldn’t allow to run. From that point, the vote went for Stellar which promised to raise the number of decentralized applications later on – and as we can conclude now, the promise was very authentic. Additionally, a flow of migration as been initiated by Ethereum clients who are turning on their radarfor a more secure platform; and many do find themselves in contact with Stellar. Everything started with with the Kin foundation announcing they were adding Stellar as a second platform, a fact that, on many levels let it clear that the Stellar network is simply a better blockchain; and this is not surprising at all, Ethereum appears to be dealing with lots of issues from long ago now – and what’s worse, the solutions haven’t been determined yet. The decision to go for Stellar was concluded with the argument of reaching an ideal asset for real-time and real-life world use you need a high-scale/speed blockchain, which both are delivered by Stellar. Just a week ago, on the same manner as Kin Foundation, decided to go for Stellar and test its platform, and the result were better than expected; which is proving even more that when clients or developers are turning to Stellar, they are more grateful for what value the platform has for smart contracts making them even happier to stay. In a time when many are feeling shaky and the confidence level is dropping, it is best to look for a choice which has been showcasing a promising future and Stellar [XLM] could be signaling to do so. 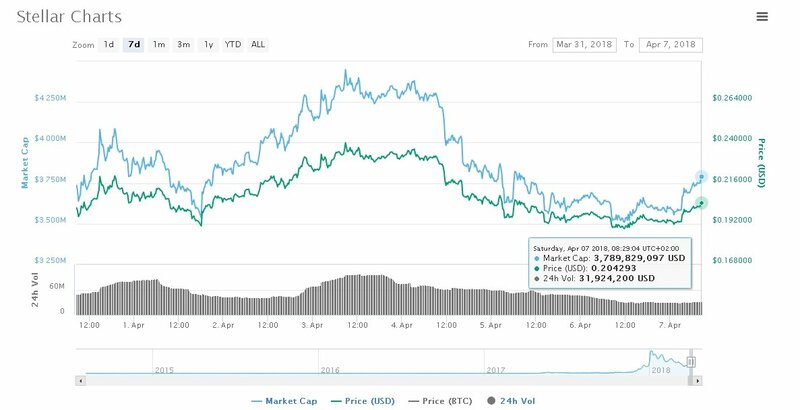 Per time of writing – Stellar XLM/USD is changing hands at $0.2040 with a 24-hours increase of 6.10% leading the BTC market for 2.77 percent, making XLM the highest gainer out of the top-ten cryptocurrency list by market capitalization.